I have always obsessed over the poster, regardless of the size of the show, its budget or time constraints. As an old advertiser, I’ve long been convinced of the importance of an event’s public face and the continuing corporate identity of my product. You might notice a theme emerging if you examine too many of these images. 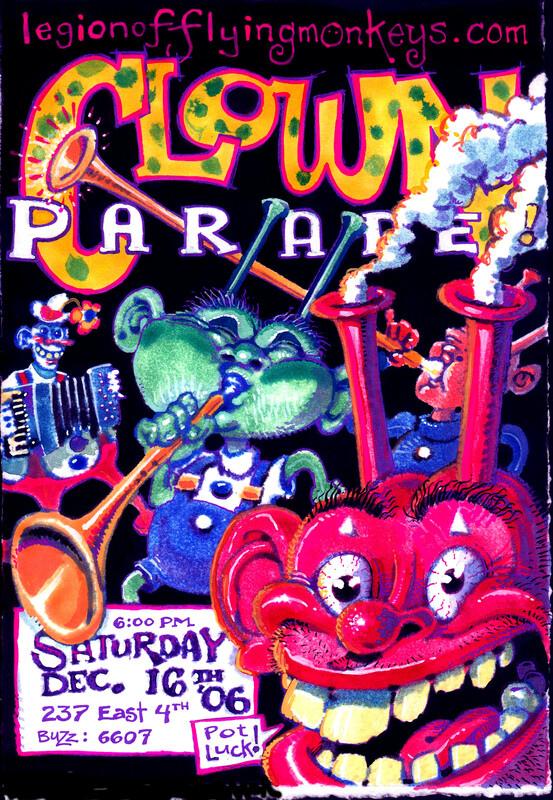 There is a backstory with the LFM, something we portray in an ongoing puppet show that explains these strange looking creatures and their constant appearance on music posters. But that’s a bit long for this diatribe about adverts. 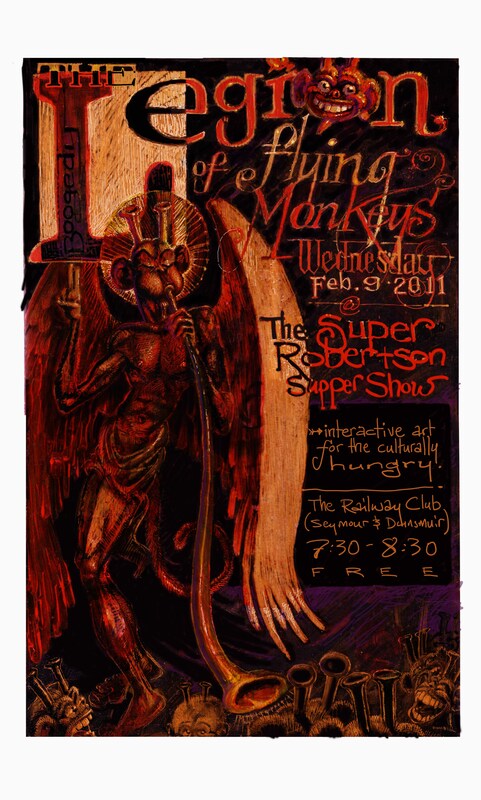 Most times, I would rather obsess over a poster than do any other work relative to an upcoming show. Posters are complete and utter self indulgence, and I hope that shows. What I have found is that a good image, like any good advertising campaign, has a strong impact upon the show itself. This is impossible to prove to disbelievers, but I worship at the feet of the gods of graphic design. I am witness to their power. 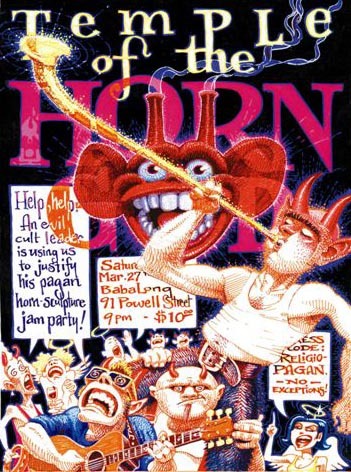 The best example I could point to is from a show at (the dearly missed) Babalong, a semi-legal burlesque joint down in Gastown. My gallery at the time, Babalong hosted several openings of my work. The first – a show of paintings and wooden trumpets – called “Temple of the Horn God”. note the tag: dress code, religio-pagan. No exceptions! Ha! At the time, we set records for attendance and costume participation (if such things can be measured). For these two moments, the scene had a consistency, a coherence that I’ve not seen since. Perhaps it was timing. Perhaps I was in the right place at the right time. But I blame the posters. 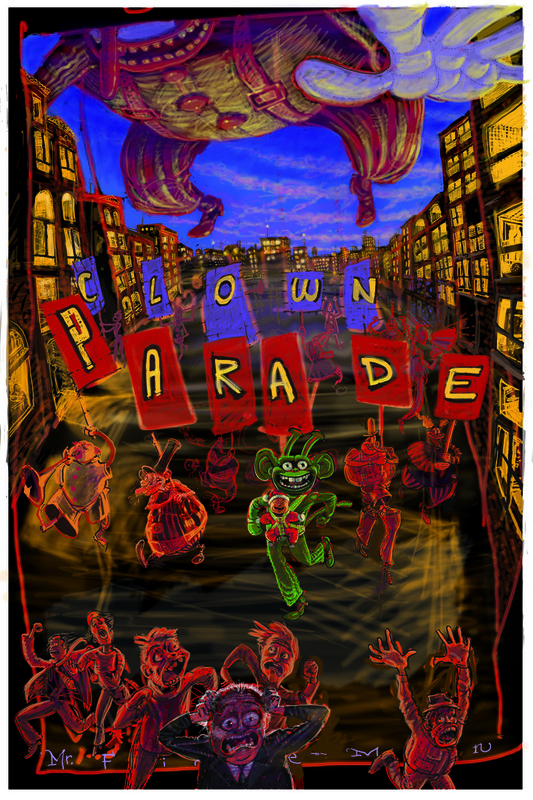 Lately, the last five years have been at least partly about Clown Parade. 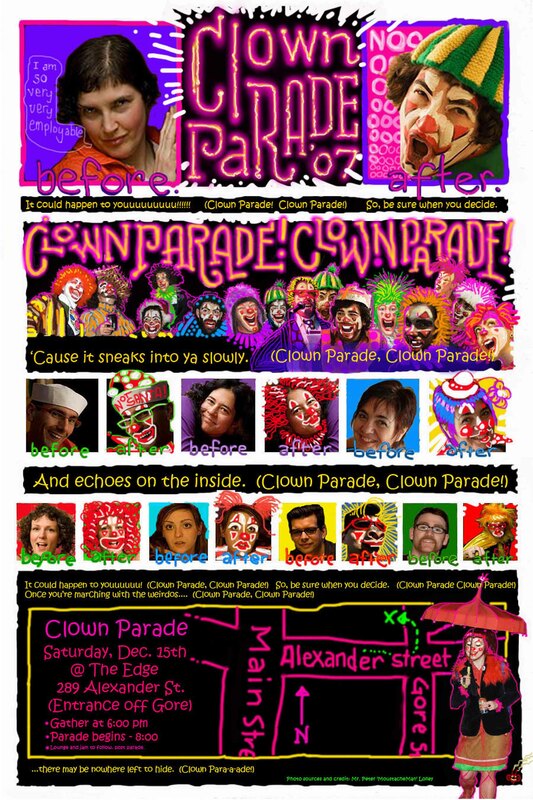 Every December, around the second Saturday, we have us a parade of Clowns through Gastown. 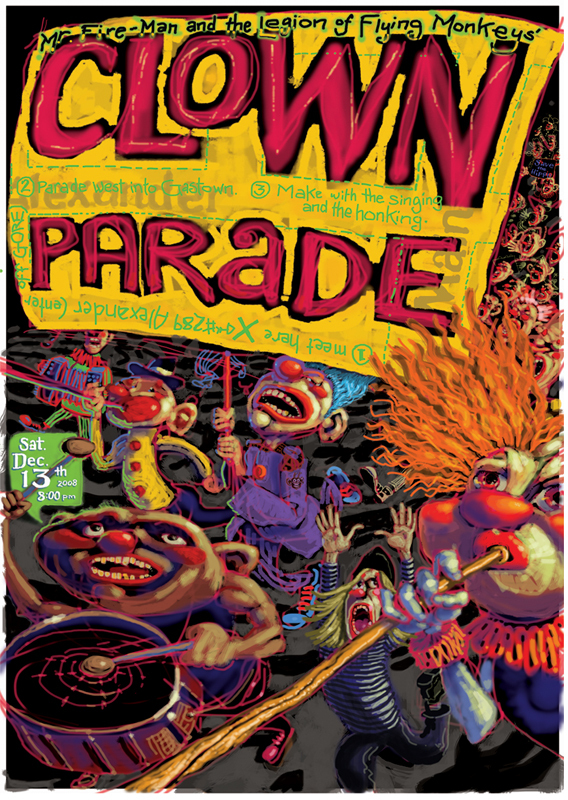 The posters are the purest whimsy, a play on the joy of clowning. 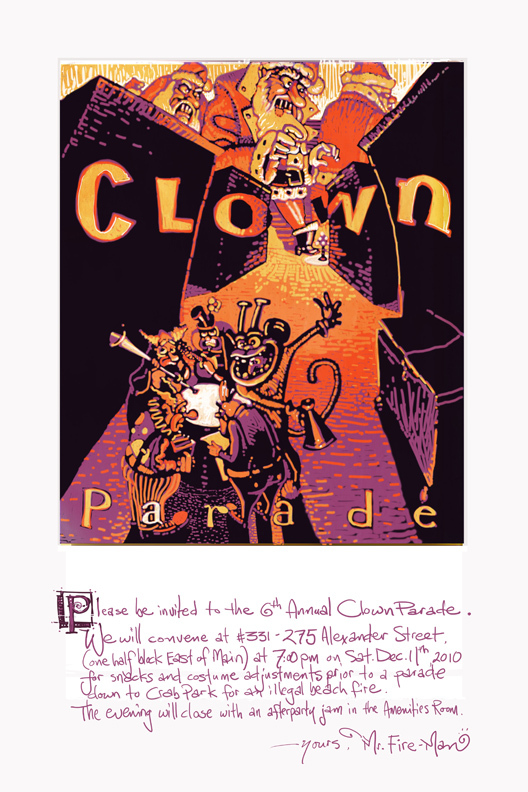 By year 5, I wanted a by-invitation-only Clown Parade. Thus, the poster could be super minimal. Just an image and a title. No map, no phone numbers, no dates. A pure expression of an invasion of clown. More to come. Hope you’re still entertained. Saw you perform at the Gibsons Jazz Festival last week…what a fantastic show. Where and when are your next shows? Howdy, and thanks for all of the lovely compliments. We’re next on in Vancouver, this August 24th at the Stanley Park 125 Celebration in Stanley Park (as you might have guessed). There will be two sets of an half hour each. Stay tuned to this site, and I’ll post more exacting info as the date comes closer. Failing that, you could look up Legion of Flying Monkeys of Facebook. Cheers!